This blog is all about positive or negative experiences I have had with companies and people over the years. Hopefully you will learn from my experiences both good and bad. Read some of my postings and how I was able to seek satisfaction from companies that did me wrong and how I was able to reward those that treated me right. Check out some amazing new items from Phottix, they have the Mitros+ Flash Transceiver that will control all the lights in your studio and so much more. Watch the short video we shot at the PhotoPlus Show in NY, perfect gift for the holidays. One of 9 videos we are doing for the companies we covered at the PhotoPlus 2013 Show in New York. See the great new Tamron lenses in this video. Meet IPA correspondent Andy Peeke doing a great job interviewing these companies. 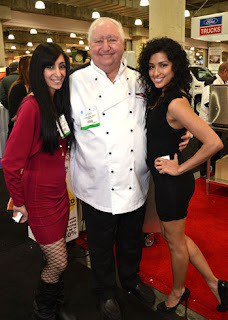 Another year and another great International Restaurant & Foodservices Show of New York. The show was held once again at the Jacob Javits Convention Center and began on February 27th and ended on March 1, 2011. As in past reviews of this show, the industry professionals who attended had the opportunity to hear from some of the biggest and best names in the industry. They met with 550 exhibiting companies and viewed and sampled the latest cuisines and the newest equipment, restaurant and foodservice products. A record number of industry professionals attended the shoulder to shoulder crowd that completely filled the lower levels show floor. From our view, this show was one of the most popular we have attended in years. But then again, this show pulls those in the industry from the entire East Coast and further and feeds them with tons of the best baked and cooked foods in the country. This year we tried to seek out companies we have not featured in our four other yearly reviews and any one reading this years review is encouraged to read our past reviews to see so many other showcased companies we couldn't mention again this year. See complete review and our video and slide show at our web site. I have worked for major corporations as their sales/marketing director or corporate communications director and I have owned my own businesses, including one major company years ago called Movie Tee's. I have a strong photographic background and my fame seems to be in the early black and white photos I shot of my cousin Neil Diamond back in the 60's. These early photos under the Brooklyn Bridge and others seem to have become the defining shots for both Neil and me. Over the years I have been an active consumer advocate, first for my aged father and now for myself and others. This blog was started as a way to reach others and teach them to be their own advocates and fight for what is right, no matter what the odds of success. I have been a corporate executive, fashion and business consultant, photographer and web site owner and journalist. As a life mentor to many, I am happy to share my successes and failures with my many readers.